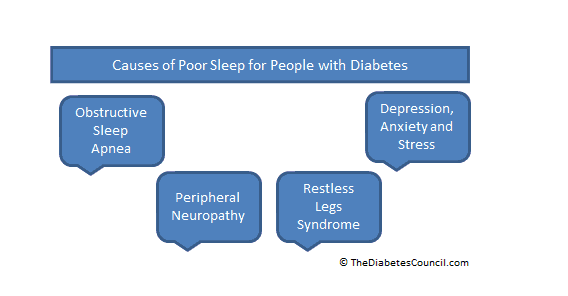 Did you know that sleep issues are far more common in individuals with diabetes? According to National Sleep Foundation, 63% of American population do not get enough daily sleep. Do you also know that most people who suffer from diabetes often have poor sleeping habits? How Does Sleep Deprivation and Unstable Sleeping Cycle Affect Diabetic Individuals? Why Are Caregivers More Prone to Diabetes? Who is at Higher Risk of Developing Sleeping Disorders? How Do You Know If You Have a Sleeping Disoder? Which Treatment Should I Pick? Your health and sleep go hand in hand. When you do not sleep enough, your body does not get the needed time to repair. As a result, you tend to be unfocused and irritable, and you suddenly have the urge to eat. If this scenario sounds too familiar to you, maybe you should rethink about the relationship between sleep and your diabetes. Sleep plays a crucial role in restoring our body cells. Under healthy conditions, after eating, the pancreas secretes insulin to signal fat cells and muscles to absorb the glucose from food to be used for energy creation and prevents the body from using fat as energy source. This chain of reaction causes the blood glucose levels to resume normal. And to prevent the individual from feeling hungry, the body produces the hormone leptin to depresses the appetite. However, when it comes to diabetes individuals, the muscle and fat cells fails to respond to insulin. This causes a high glucose level in the bloodstream. To compensate for this problem, the pancreas secretes even more insulin into the bloodstream and consequently result in high level of insulin. So what happens when sleep deprivation or unstable sleeping cycle occurs? Research studies have found that they drastically affect how the body regulate hormones and utilize glucose. Under such circumstances, the glucose metabolism in healthy individuals react very similarly to individuals with type 2 diabetes; their bodies’ response to insulin decrease by 30% and the glucose absorption rate decreases by 40%. 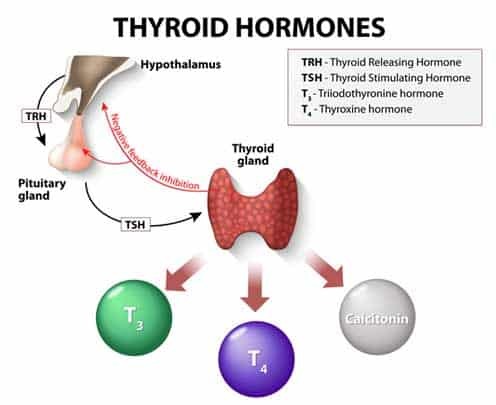 At the same time, there is a decrease in thyroid stimulating hormone and increase in cortisol (the “so-called” stress hormone) secretion. To make things worse, because the body cannot properly utilize the glucose, it triggers a release of the hormone ghrelin to stimulate appetite. This is why people tend to feel hungry all the time and are more likely to engage in binge eating when they do not have enough sleep. Individuals who suffer from frequent sleep deprivation or unstable sleeping schedule are much more likely to develop poor eating habits and suffer from obesity. Over time, they are at a higher risk of developing type 2 diabetes. If sleep deprivation can cause such a damaging reaction to healthy individuals, you can see why it can cause many complications for diabetic patients. When you already need extra insulin to keep your blood glucose level stable, sleep deprivation can make your medication and insulin injection less effective. If the condition goes undetected, hyperglycemia (high blood sugar) can leave you waking up frequently needing to urinate or even get something to drink. In severe cases, you may suffer from diabetic hyperosmolar syndrome and diabetic ketoacidosis. On the other hand, if you overcompensate for unstable blood glucose level, you may end up experiencing hypoglycemia (low blood sugar) when you sleep. In mild cases, you may experience intense nightmares, sleep talking, and even that feeling as if something very heavy is put on your chest. You will also wake up feeling shaky, dizzy, drenched in sweat, thirsty and hungry. For individuals who suffer from hypoglycemia unawareness, this can turn into a life-threatening case of severe hypoglycemia in which seizures, loss of consciousness, and even death can occur. In addition to unstable blood glucose level and related complications (for example, weight gain, cardiovascular diseases, neuropathy damages, kidney and pancreas damage, blindness, and amputation), sleep deprivation and the unstable sleeping cycle can also increase your risk of developing various sleep disorders. All these conditions can adversely affect the quality of sleep you get throughout the night and begin a vicious cycle between your blood glucose level and your sleeping quality. 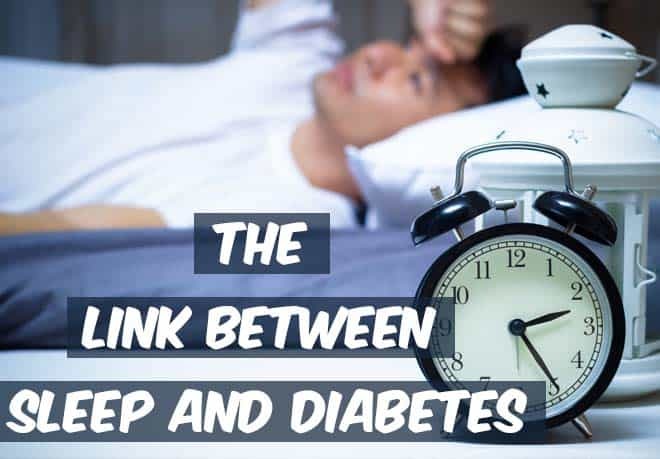 For caregivers who do not suffer from diabetes but are caring for someone who has type 1 diabetes, you are most likely to wake up at odd hours to monitor their conditions. Depending on the severity of the patient’s symptoms and whether the patient suffers from hypoglycemia unawareness, you may need to make several monitor trips throughout the night to perform blood glucose test and administer insulin medication. And when you go back to bed, you are more likely to worry about the patient and jerk yourself repeatedly awake for fear of not hearing the patient during a hypo or hyper episode. Because of this and the worry and stress associated with parenting a child with diabetes, caregivers often suffer from depression, anxiety, and panic attacks. Even if you take a nap to make up for lost sleep during the daytime, the poor sleeping habit will make your body resist insulin and secrete more ghrelin and cortisol to encourage binge eating. These two main factors escalate your chance to become a pre-diabetes candidate. If the poor sleeping habits continue, your endocrine system will no longer function normally from the constant damage to your pancreas and kidneys. In such cases, you are very likely to become diabetic. Who is at High Risk of Developing Sleeping Disorders? Restless leg syndrome makes you feel a constant urge to move your legs to avoid peculiarly uncomfortable sensations. It is a different feeling than just muscle cramps; the feeling is considered too uncomfortable for many individuals to fall asleep. Many people describe this strange sensation in their legs as a gnawing, crawling, or electrical feeling that causes them the need to move their legs. Although the move can shortly relief the sensation, it begins again until you shift your legs again. This repetitive movement can occur as often as every 20 to 30 seconds throughout the night, making it impossible for the individual to have any solid sleep. Restless leg syndrome a tricky disorder to diagnose as it usually occurs at night during sleep and rarely happens when you are at the doctor’s office. Obstructive sleep apnea is a sleep disorder that causes stops in breathing during sleep. The duration of breathing pauses is called apnea. Apneas are caused by a blockage of the upper airway. During this time there is a brief pause in breathing and oxygen levels in the blood decrease. Eventually, you will wake up, and the muscles in your throat start to work again. This may make you wake up gasping for air or frequently coughing throughout the night. Other times, the apneas may be interrupted by the individual briefly waking up or shifting their sleeping position without any acknowledgment that they are disturbed in their sleep and they are awoken by the struggle to breathe. However, if an apnea individual’s sleeping pattern is measured in a sleep laboratory, technicians can record fluctuations in the brain waves that are similar to the brain waves during awakening state. If you suffer from obstructive sleep apnea, you will not be able to enter into the deepest stages of sleep with the constant struggle to breathe. Without allowing your brain to enter the REM cycle, you will not be able to get any benefits from the rest no matter how many hours you stay in bed. In addition to preventing sleep, sleep apneas reduce the amount of oxygen going to the brain and heart. To receive sufficient oxygen to the brain, individuals tend to exert more pressure from trying to breathe and consequently stretches the heart. This chain of reaction brings on a diuretic effect and increases the frequent urge to urinate. You may hear that men often blame their prostates and women blame menopause for this problem. But it is sleep apnea that is causing them the frequent bathroom trips at night. 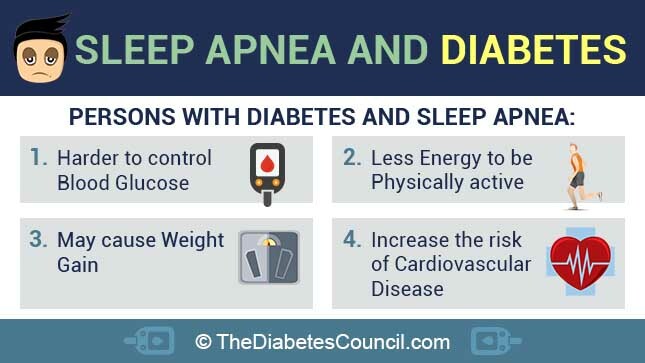 Even though obesity may not be the underlying cause of sleep apnea and diabetes, it often becomes one. When an individual constantly does not get enough sleep, they are much more likely to make bad food choices, has less willpower to stop themselves from binge eating, and become too exhausted to exercise regularly. All these bad habits will cause rapid weight gain and make obesity part of the problem. Although many people know that diabetes can cause hypertension and heart diseases, studies have found that even a single night of sleep deprivation can put a detramental strain on diabetic individual’s blood pressure and increases their blood pressure the next day. This discovery can illustrate the importance of sleep and how a small change in sleeping habits can contribute to cardiovascular disease and stroke in diabetic individuals. There is also growing evidence of connections between obstructive sleep apnea and heart disease, and connections between diabetes and heart disease. People who have apnea usually experience multiple awakenings each night apnea. Each time they jerk awake from an apnea episode, they also experience a brief surge in their blood pressure. Over time, this constant fluctuation in blood pressure can cause conditions of chronic hypertension and other cardiovascular diseases. For diabetic individuals who already have a predisposition of having high blood pressure, these surges during sleep can become fatal as they can bring about a stroke or a heart attack. Also known as frequent urination. This problem can constantly wake you from your sleep and make you dehydrated. As mentioned earlier, sleep apnea can bring an onset problem of nocturia because of the elevated blood pressure and overworked respiratory system. On top of that, imbalance in hormonal secretion and and urinary tract infection due to dehydration and weak immune system may contribute to this condition. Diabetes and sleep disorders can truly weaken your immune system and cause serious complications. For example, neural damages from peripheral neuropathy and diabetes complication can result in constant pain that makes it very difficult to fall asleep and stay asleep. Other common causes of chronic pain can be chest pain from cardiovascular diseases, fibromyalgia, and lower back pain from obesity. Not knowing if you can get a restful sleep each night can be stressful and full of anxiety. This psychological burden can manifest as physical symptoms such as nightmares, sleep talking, sleepwalking, teeth grinding or jaw clenching. At the same time, stress will make you release more testosterone, adrenaline, and cortisol hormones and subsequently cause hyperglycemia and significant increase in blood pressure and blood glucose levels. These changes will make you feel thirsty and induce nocturia. But even if you have administer the correct dose of insulin before sleep, your body may resist the insulin due to insulin resistance. If your blood glucose level is left untreated within a tight time frame, you may experience ketoacidosis (diabetic coma). If a single night of sleep deprivation can make you short-tempered and grumpy the next day, imagine how you will feel if you experience sleepless nights consistently. One of the most common symptoms is long-term mood disorder. Research studies have extensive data demonstrating the correlation between sleep disorders with mood disorders such as depression, anxiety disorders, panic attacks, hallucinations, and even psychosis. Sleep helps our body to repair and regulate our immune system. Without enough sleep, the body will not be able to repair the daily probably. And without proper regulation of the endocrine system, the immune system will go haywire and will not be able to defend the body against infections. And as type 1 diabetes is an autoimmune disorder where the immune system attacks the insulin-producing pancreas cells, sleep deprivation may trigger even more irreparable damage to the pancreatic cells. When nothing seems to work, people tend to use alcohol and over-the-counter medication as a sleeping aid. But as individuals can build tolerance over these substances, they have to constantly increase the dosage to receive the same sedative effect. Consequently, they are at a high risk of becoming physically and psychologically dependent on these substances. How Do I Know If I Have Sleeping Disorder? If for any reason you feel that you no longer feel refreshed after a night’s rest, do not hesitate to visit your doctor for consultation. The sooner you find out the underlying problem to your sleeping problems, the faster you can get your sleeping cycle back. 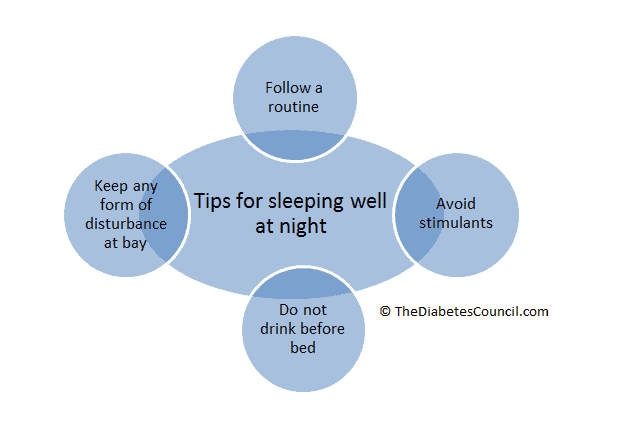 For diabetes individuals, sleep is equally important as diet choices. Without sufficient sleep, you will feel a lack of energy and fatigue. In this state, you are more likely to develop insulin deficiencies and more likely to veer off your regular activity and diet schedule. But many people will ask, “how many hours of sleep do I need?” There is no science formula to calculate the amount of sleep you need to get sufficient amount of rest. According to science studies, most people need 7 hours of sleep per night to feel rested. But ultimately, your body genetically and physically determines your sleep requirement. For some people, they may need only 5 hours of sleep to feel rested; for others, it may be 10 hours. Then the next question is, “how do I know if I have enough rest?” This answer is much simpler. If you set your alarm clock and you are able to wake up before the alarm goes off, it means that you have gotten adequate sleep and your brain is alerting you that you are well rested and ready for your day. The diagnosis for children is quite similar to the adult diagnosis. However as your child may lack the vocabulary to explain any symptoms they have, you need to pay close attention to your child’s behaviors and symptoms beforehand, and go through the list with the doctor. One of the symptoms you must alert the doctor is whether your child suffers from snoring. Treatment for sleep disorders can differ depending on the underlying cause. However, it generally includes a combination of medical treatments and lifestyle changes. Depending on the severity of your sleep disorder, your doctor usually recommend the simplest treatments. If there is no improvement or your disorder is too severe for simply treatments, your doctor may recommend intense medical treatments or even surgeries to fix a physical problem. For insomnia, unless there is a physical underlying cause, non-medical treatments tend to be more effective than medical treatments. Some non-medical treatments are relaxation training, breathing exercises, meditation training, and guided imagery technique training. When paired with healthy life habits such as regular exercise and setting a firm sleeping time, many individuals have achieve success in managing their stress and find sleep to be much more enjoyable. For individuals who suffer from chronic insomnia, the doctor may prescribe medication for immediate relief as a short-term treatment. Insomnia medications includes benzodiazepine hypnotics, non-benzodiazepine hypnotics, and melatonin receptor agonists. Although there are many alternative medicine options to consider, it is very important to consult your doctor before trying any of these supplements as they may affect your diabetes medicine. Depending on the severity of the nerve damage and the cause of the peripheral neuropathy, your neurologist may recommend different treatment for the disorder. For example, if the underlying cause is due to specific vitamin or mineral deficiency, your doctor will prescribe vitamin supplement therapy along with nutritionist consultation. If the damage is related to diabetes complications, your doctor may revise your diabetes medication to slow down the nerve damage progression and ease your chronic pain symptoms. In extreme cases where your limb suffers from extensive nerve damage, amputation may be the only treatment. The cause of restless legs syndrome is not always conclusive. For mild cases of the disorder, your doctor may suggest massages to your lower leg before bedtime or use of warm packs to ease the sensation. Many patients have found exercise during daytime and stretching before bedtime to be a great treatment for restless legs syndrome. If the disorder is cause by nutrient deficiencies, your doctor may prescribe dietary supplements such as iron, magnesium, vitamin B, or folic acid depending on your blood test results. To ease the pain, over-the-counter pain medication such as acetaminophen and ibuprofen has found to be useful. If you decide to use any anti-inflammatory medication, talk to your doctor first to ensure they are safe for your diabetes symptoms as well since they may increase your risk of developing heart problems. Similar to other sleep disorders, obstructive sleep apnea can be cause by a number of underlying factors. Depending on the patient’s condition and the severity of the apnea episodes, the doctor may recommend lifestyle changes along with various treatments. In severe cases where all treatments fail, surgery may be the last option to fix the problem. If you suffer from mild to moderate obstructive sleep apnea where your tongue rolling back is causing the problem, there are oral treatment devices that may help alleviate your symptoms. They are also beneficial for individuals who suffer from craniofacial retrognathism (a condition in which the lower jaw is shorter than the upper jaw). All these devices must be custom fitted by a dentist or an orthodontist. They are usually worn in the mouth at night during sleep. This is the most widely used apnea mouth device. When it comes to appearance, it looks very similar like a sports mouth guard. They are fitted over the upper and lower dental arches, and may have metal hinges to ease the lower jaw forward. This device is a splint that keeps the tongue in place so that the airway maintains open for breathing. The tongue retaining device is most beneficial for individuals who sleep regularly on their backs or stomachs, and snore frequently. By wearing the tongue retaining device, individuals have found that the device greatly reduce the frequency and loudness of their snoring as well as jerking awake due to choking. Patients who should NOT try it: Individuals who have central sleep apnea or are morbid obesity. These devices are also unsuitable for patients who wear dentures or have poor dentition because the teeth are essential to hold these devices in place. Those individuals who suffer from apnea due to acute temporomandibular joint derangement or disc displacement are unsuitable for the device as well. In addition, those with steep mandibular planes or long necks also tend to have less success with these oral appliances. Nasal strips are very common these days as an over-the-counter treatment for snoring. You may already have seen them at the grocery stores or local pharmacies such as CVS, Walgreens, and Riteaids. 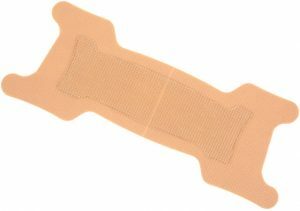 If you have not seen one before, a nasal strip looks like a bandage in appearance. It is actually a “spring-like” strip that is applied to the nostril flare areas, tugging the nostrils gently and dilating them to allow more air to pass into the nose. They are beneficial for individuals who are born with narrow nostrils and have difficulty breathing because of the problem. These nasal strips are also effective for person who suffer from frequent nasal congestion, mild obstructive sleep apnea, or snoring due to nasal congestion, a deviated septum, or nostril collapse. For severe cases of sleep apnea, although they may not be able to help with treating the apnea episodes, they may still be helpful for patients to minimize snoring. At the same time, it has been proven beneficial for patients who use the nasal strips in conjunction with their CPAP machines to maximize airway to the lungs. There are many brands of nasal strips available on the current market. 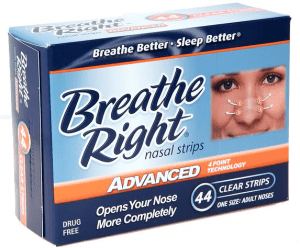 According to statistics, Breathe Right Nasal Strips is the most reliable and most popular choice on Amazon.com. Although they may be slightly more expensive than generic brands, many reviewers have praise Breathe Right for the comfortable adhesive ability being durable throughout the night yet gentle on the skin. If you are not an online shopper, you can also purchase them at most local pharmacies and grocery stores. Use your thumb to block one of your nostril. Gentle dilate your other nostril by tugging it open sideways towards your cheek. Breath in normally through the dilated nostril. Repeat the same procedure on your other nostril. If you feel that there is an instant improvement in the airflow and you can breathe easier from dilating your nostril, then nose cones will be beneficial with your current condition. If you feel that there is no improvement to your breathing, then it is likely that your problem is too complex for both nasal strips and nose cones. In such circumstances, you may need to see a specialist about the physical obstruction problem that contributes to your sleeping disorders and sleep deprivation. Like nasal strips, there are many brands of nose cones on the market. Although they work in the same way, they are slightly different in designs and material use. Of the choices available, Max-Air Nose Cones is the most popular choice as they are made with surgical rubber and comes in 3 different sizes for optimal fitting. They are available on their official website or you can call to order at 1-800-797-0361. 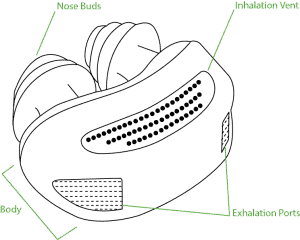 The company Airing Micro-CPAP has invented a small maskless, hoseless nose device to relieve apnea symptoms. Please note that although it is advertised as a “micro-CPAP”, it is NOT a CPAP machine. Although it can keep your airway open during breathing, it is nowhere as powerful as a CPAP machine as the Airing device is powered by battery. For individuals who suffer from mild to intermediate level of sleep apnea, the pressure created by the Airing nose device micro air blower may already be sufficient to keep them breathing comfortably in their sleep. As this device is still in the production phase, you may want to keep an eye out for their release date. To find out more about the Airing Micro-CPAP nose device, you can visit their official crowdfunding website for further information. Oxygen concentrator. Using supplemental oxygen supply during sleep may help if you have central sleep apnea where you stop breathing. Different forms and concentration of oxygen are available for the patient’s specific needs. Continuous positive airway pressure (CPAP). 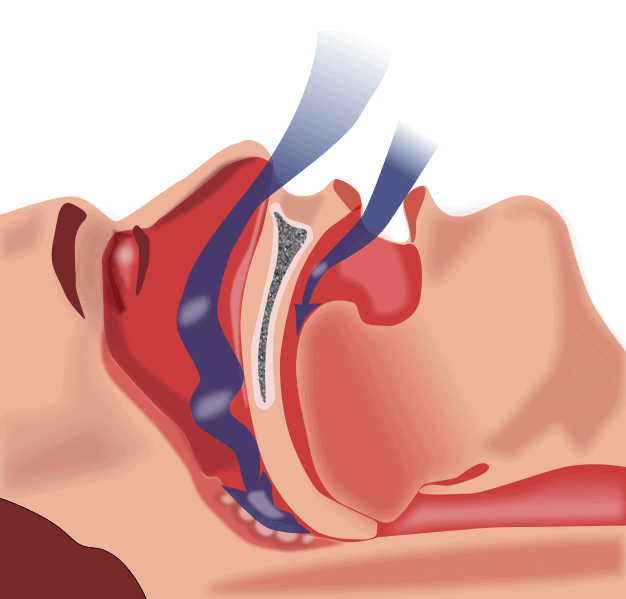 This method is most commonly used for obstructive sleep apnea treatment. It involves the patient to wear a pressurized mask over their nose during sleep to keep the airway from collapsing so that the patient can breathe properly. Aside from sleeping apnea, CPAP has proven to be beneficial for snoring as well. Bilevel positive airway pressure (BiPAP). Essentially serves the same purpose as a CPAP machine. But unlike CPAP, which supplies a constant pressure to the upper airway as the patient inhales and exhales, the BiPAP builds to a higher pressure when you breathe in and decreases to a lower pressure when you breathe out. This machine is more beneficial for patients who have problem exhaling against the incoming air. Adaptive servo-ventilation (ASV). This most recent airflow device operates by learning the patient’s normal breathing pattern and stores the information in a built-in computer. When the patient falls asleep, the machine sets the pressure to normalize their breathing pattern to avoid pauses in their breathing. ASV has proven to be most successful at treating complex sleep apnea in some people. CPAP Machines and Oxygen Concentrators have similar functions in the way they push air into the lungs through a rubber tube to help with medical conditions that disrupt sleep. Both devices are also similar in that the flow settings are usually prescribed based on the patients’ needs. An oxygen concentrator operates by filtering the air in the room to deliver oxygen. The oxygen in a medical oxygen concentrator can reach purity levels between 87 to 93%. Oxygen is delivered in two forms: pulse dose and continuous flow. In order to ensure an oxygen concentrator is operating at optimal function for your needs, you will undergo several tests under a lung specialist. These tests will help determine the current state of your lung function and if you need to use oxygen therapy. Oxygen concentrators are available in portable and home models. A CPAP machine is typically used to treat severe Obstructive Sleep Apnea (OSA). It operates by pushing a constant stream of air into the airways as opposed to concentrated oxygen like the oxygen concentrator. A CPAP machine’s function is to provide a stream of air that provides a cushion to prevent the throat muscles from collapsing due to OSA. A sleep therapist will work with you to determine the dosage setting necessary for your CPAP machine. In a sense, oxygen concentrators and airflow devices serve the same purpose: they keep a patient’s blood oxygen levels within an acceptable limit. However, the similarity ends here as the two types of devices work in completely different ways. And although there are a few exceptions, the two types of devices are mainly used to treat completely different sleep disorders. Oxygen concentrators serves the main purpose of providing oxygen-enriched air for the patient to breathe. Oxygen concentrators are for patients who need extra oxygen to compensate for a variation of heart and lung conditions such as emphysema and congestive heart failure. They operate by running room air through containers of filters made of zeolite to omit nitrogen out of the air and leaving the air up to 45 percent richer in oxygen. Airflow machines are air pressure devices for keeping the airway from collapsing so that the patient can breathe throughout sleep without suffocating and choking. In fact, the first models of airflow machines were built based on vacuum. These airflow machines are only used to treat one thing — obstructive sleep apnea. They operate by acting as a pressure pump to increase air pressure to a precise recommended setting and distribute the pressurized air to a mask against the patient’s face. This air mainly inflates the patient’s soft palate from blocking the airway. Although the oxygen concentrators and airflow machines both deliver air to a facemask, the two masks are designed differently. In general, airflow machines deliver much higher pressure to the mask than do oxygen concentrators. Even though both type of devices increase blood oxygen level, the airflow machines achieve this effect by permitting the patient to breathe more efficiently and not by supplying supplemental oxygen. Please note that in cases where the patients require supplemental oxygen constantly 24 hours a day, the doctor may prescribe a conjunction use of both the oxygen concentrators during daytime and airflow machine at night during sleep. But for most sleep disorder cases, the doctor will prescribe only the airflow machines as breathing aids. Many people who use airflow machines state that they immediately feel better overnight once they begin their treatment. After their first night of sleep with the machine, they feel refreshed in the morning. In addition, they can concentrate better on their work and no longer feel a general sense of malaise throughout the day. In addition, their family members have made fewer complaints about the patients’ snoring and sleep disruption. As for children and infants who suffer from sleep disorder, airflow machines can greatly increase the survival rate of infants whose lungs have not fully developed. The principal disadvantage to airflow machines is that not everyone can adjust to to sleeping with the device overnight. Depending on what position you usually sleep in, you may need to adjust to a new sleeping position to accommodate the facial mask. As a result, some people have difficulty sleeping the first few nights of the treatment. If you have any of these problems or any other problems with your CPAP machine, do not hesitate to call your doctor. There may be ways to readjustment the machine to better fit your needs. For example, if you are constantly having dry mouth and dry nasal passages, there are some CPAP machines that are equipped with heated humidifiers to reduce your problem. For other problems, your doctor may prescribe a custom cushioned face mask and chin straps to relief the irritation on the bridge of your nose. For any reason the mask is irritating your skin or your face, let your doctor know. There are options and accessories available to make the mask sits comfortably on your face. In order for you to receive the full benefits from the airflow machine, you must learn how to put on the mask correctly. Usually, as long as you ensure that the mask is properly sealed and the air pressure from the tube remains constant, the machine will work its magic. If you find the prescribed pressure to be too much for you, let the doctor know and request to start with lesser pressure. Once you get used to the machine, you can readjust the pressure to suit your needs. If your sleep disorder has proven to be too severe and complex for all other options, your doctor may recommend certain surgical procedure as treatment. Somnoplasty is also known as temperature-controlled radio frequency (TCRF). It is a minimal invasive surgical procedure that utilizes radiofrequency currents to decrease tissue volume at a specific location that is causing the sleep disorder. UPPP is the typical apnea surgery procedure of removing the soft tissue from the back of the throat to permit more airflow passing through the air passage in and out of the lungs. A procedure in which a system is implanted in the patient to sense breathing patterns and delivers mild stimulation to keep the airway open during sleep. This method may be beneficial for individuals who do not benefit from the airflow machine therapies. If obesity is the main cause of the sleep disorder as well as diabetes, procedures such as bariatric surgery, gastric banding, sleeve gastrectomy, and gastric bypass surgery may be recommended to achieve significant overall weight loss. Liposuction and removal of fat tissue in the upper thorax and neck may also be suggested to remove the obstruction to the breathing pathway. These are the first line therapy for patients who have BMIs greater than 40 and are severely obese. In general, your doctor will provide you with the most simple and least invasive treatment as your initial treatment. However, your specialist may have much more experience treating patients with symptoms similar to your conditions and will have better recommendation as your treatment. Sleep disorders are often a byproduct of another underlying health problem. As a result, doctors typically do not prescribe medicines to treat sleep disorders. However when patients suffer from chronic sleep deprivation, the doctors may prescribe supplements or sleeping tablets as an immediate short-term relief so that the patients can restore their normal sleep patterns. These sleeping tablets are only prescribed as a short-term treatment because they are highly addictive and can lead to overdose if not properly used. At the same time, sleeping tablets have many side effects such as inhibiting the ability to drive and operate machinery. These effects can persist til the next day and can cause serious side effects or overdose if combined with alcohol consumption. So before you start taking sleeping medications, ask your doctor about possible side effects. In case you wonder what possible medications are prescribed for treating sleep disorders, here is a list of medications that have been used to alleviate various symptoms that stems from sleep disorders. The list includes antidepressants, respiratory stimulants, central nervous system stimulants, and hormones. Modafinil is classified as a wakefulness-promoting agent. Itis often prescribed for patients who have responded moderately to airflow machines and are experiencing symptoms such as excessive daytime sleepiness, narcolepsy, and shift work sleep disorder. Patients should be aware that Modafinil is not a treatment for these sleep disorders; it only alleviate the symptoms. Those who are treated with Modafinil may feel more focused during the daytime. Those who undergo Modafinil treatment must use airflow machines during their sleep because taking Modafinil without CPAP severely increases the chance of cardiovascular side effects. Other side effects of Modafinil may cause nausea, dizziness, headache, anxiety, chest pain, and insomnia. Acetazolamide is classified as a respiratory stimulant that is commonly used by mountain climbers to avoid altitude sickness. This medicine has shown success in decreasing the number of apnea episodes and frequency of daytime sleepiness. However, patients may develop tolerance of Acetazolamide when it is used for an extended period. Under such circumstances, the medication may no longer work as well unless the dosage is readjusted. Also, patients with diabetes should be aware that Acetazolamide is a diuretic. Although it may also help with swelling of the legs due to poor circulation, it can also lead to dehydration that will affect the blood glucose level and increase the chance of blood clots and deep vein thrombosis (DVT). In addition, patients should be aware that Acetazolamide may cause a deficient of potassium in the blood. To compensate for this problem, the doctor may recommend a diet rich in potassium or a potassium supplement during the treatment. Clomipramine is most commonly used to treat obsessive compulsive disorders. It is classified as a tricyclic antidepressant that alleviate certain sleep disorder symptoms by restoring hormonal balance in the brain. As a result, it can greatly improve sleep and decrease the number of apnea events. Please note that Clomipramine may cause impotence in some patients. Patients who have a history of heart problem or have experienced a recent heart attack should not take this medication. Theophylline is often used to treat symptoms of chest tightness, shortness of breath, and wheezing due to various pulmonary problems such as asthma, emphysema, and chronic bronchitis. 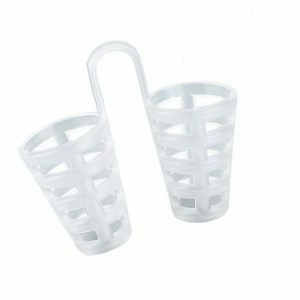 It works by relaxing the airways in the lungs so that the patients can breathe much easily. It is also used to reduce sleep apnea because of airway blockages. For children, toddlers, and babies who suffer from sleep apnea as a result of under-developed lungs and/or are unsuitable candidates for surgery procedures, theophylline may be prescribed to ease the breathing problems. Please note that one major side effect of this medication is insomnia. To prevent the problem, a diet free of caffeine and stimulants is highly recommended. Other side effects can be upset stomach, diarrhea, headache, increase in heart rate, skin rash, and irregular heartbeat. Diabetic patients who have heart complications problems or have sensitive skin may want to avoid this medication. Protriptyline is commonly known as Vivactil. It is classified as a tricyclic antidepressant; it is often used to treat mood disorders such as depression by restoring the hormonal balance in the brain. It has shown to increase energy level and improve mood to bring about a better sense of better well-being. Similar to Clomipramine, Protriptyline has shown success in decreasing apnea symptoms during sleep as it actively decreases the amount of REM sleep state (apnea is much more predominant during REM cycle than any other sleep state). At the same time, it has side effects that are similar to Clomipramine as well’ Protriptyline has shown to cause side effects such as constipation, urinary retention, and dry mouth. IMPORTANT: Please note that all these medication may cause serious side effects and complications for diabetic patients as well as patients who have other pre-existing health conditions other than sleep disorders. Before taking any of these medications, you should consult with your doctor and your specialist about all possible side effects so that you have a sense of what side effects you can expect. Valerian comes from the root of a perennial plant that is native in Europe and parts of Asia. Known for having a calming and anti-anxiety effect, it has a long history of being used as a sleeping aid remedy and a sleep disorders herbal remedy. Clinical health studies have found the Valerian extract to be beneficial for individuals who suffer from sleep disorder mostly due to stress and anxiety. In general, it improves sleep quality for patients who suffer from insomnia and cases of chronic sleep deprivation. But because the extract contains chemical that affects the central nervous system, it should be not used in conjunction with other depressants such as benzodiazepines, barbiturates, ethanol, and antihistamine medications as it may result in an overdose situation. Melatonin is a hormone that is naturally produced by the pineal gland in the brain. It functions as a circadian cycle regulator (circadian cycle is commonly known as a person’s biological clock of sleep/wake cycle). For normal, healthy individuals, the melatonin level is lowest in the early morning hours. It increases throughout the day and remain at peak level during the nighttime. Low melatonin during the nighttime is found to be correlated with individuals who suffer from sleep disorders and in older adults. It has been proven that melatonin supplements are useful at treating jet lags (it is most beneficial for individuals who need to fly across 5 or more time zones to the east direction). 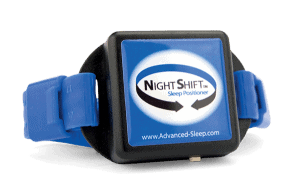 It is also beneficial for shift workers who need to constantly shift their wake/sleep cycle. Aside from its beneficial properties of resetting sleep cycle, melatonin has also been used to treat insomnia, seasonal affective disorder (SAD), and chronic cluster headaches. Even though melatonin can alleviate many symptoms of sleep disorders, diabetic patients must alert their doctor before taking any melatonin supplements because this hormone increases blood glucose level by increasing the body’s insulin resistance. It has also been known to cause complications for autoimmune diseases. Patients who have type 1 diabetes should avoid taking any melatonin supplement unless instructed by their specialist. At the same time, it is known to reduce alertness and increase sleepiness during daytime. Other side effects includes headache and nausea due to sleepiness, and increase in depression symptoms. St. John’s Wort contains 2 main ingredients: hypericin and hyperforin. These two chemicals are beneficial in treating sleep cycle disturbances. When combined with Valerian, it can treat sleep disturbances caused by depression, sleep deprivation, and narcolepsy. However, these two chemicals in St. John’s Wort have also shown to cause complications when it is taken with many prescription medicines. You should never take this herbal remedy if you are already taking any antidepressants, antibiotics or warfarin. At the same time, research studies have found that St. John’s Wort can diminish the effectiveness of Plan B contraceptive (Aug, 2016). Vervain is often used as a mild pain reliever. Although many people uses the extract as a homeopathy treatment for sleep apnea, anxiety, and depression, there are very little evidence that it has any benefits for these sleep and mood disorders. Sometimes used as a natural food and beverage flavoring, passionflower was once approved as an over-the-counter sedative and sleeping aid in the United States but has been taken off the approval list since 1978. Used as an alternative medicine, it is used to treat a wide genre of disorders and diseases ranging from sleep problems, stomach upset, narcotic drug withdrawal, asthma, seizures, menopause, high blood pressure, fibromyalgia, to anti-inflammatory aid. To increase the effectiveness of the herb, passionflower is often mixed with other plants such as Californian poppy, peach leaves, and scullap. It is often administered in combination with Valerian as well. For patients who suffer from depression, passionflower should be avoided as it tends to intensify depression symptoms. Chamomile is often brewed as a tea to calm the body and relieve the nerves. It is often used along with honey and mint to help soothe the stomach and open up airway for easier breathing. When it comes to treatment for sleep disorders, the most effective methods are to establish good lifestyle habits and lose weight. Once these goals are achieves, many diabetic individuals have discover that their sleep disorders seem to go away and their blood glucose level become much more stable. Sleep disorders are often results of poor lifestyle and sleeping habits. The first being sleeping at different time each night for different duration of time. As mentioned earlier in this article, just one night of disruption in sleep cycle is enough to increase your blood glucose level, insulin resistance, and cortisol secretion. 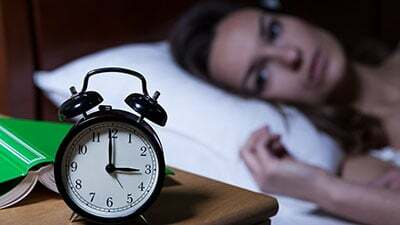 In order to prevent such series of chain reaction to occur, it is crucial for diabetic individuals to set a sleeping schedule and stick to it. Going to bed and rising in the morning same time every day will not only stabilize your hormones and blood glucose level, but also make it much easier for you to fall asleep and stay asleep. Also, even though it may be tempting to stay up late and sleep in during the weekends, it will make it harder for you to fall asleep and wake up during the weekdays. By sticking to your sleep schedule even on the weekend, you will find that your sleep quality will become much better than ever. Aside from establishing a fixed sleeping schedule, it is equally important to establish a familiar setting for sleep. Making sure your room a slightly cool and well-aerated will allow you to stay asleep without needing to wake up sweaty or clammy. If your mattress or pillow are giving your problems, find out the source of the problem and fix it. If your mattress is too hard or lumpy, changing a new mattress is the easiest solution. But if you lack the funds or your spouse find the current mattress to be comfortable, you can always get a mattress pad as a solution. If your pillow is too soft or too firm, find a better pillow for your needs. Changing your duvet for summer and winter may also help you sleep better at night. If you live in an area where the atmosphere is arid, you may want to put a humidifier in the room while you sleep. If you have sinus problem or nasal congestion, adding a small amount of peppermint, lemongrass, or lavender oil extract to the humidifier may help you sleep better at night. Aside from making your room as comfortable as possible, keeping your room dark will also allow you to sleep better. If you suffer from snoring and choking while sleeping on your back, putting a tennis ball beside you while you sleep can be a simple solution to your problem. While you are asleep, by rolling onto your back and sensing the ball against your back, you are very likely to roll back to sleeping on your side. You can also sew a pocket in the back of your pajamas top, and insert the tennis ball for the same purpose. Choose proper sleeping clothes and avoid wearing too much clothes to bed that will make you sweat profusely during sleep. Elevate the head of your bed slightly so that you can prevent choking and snoring. Purchase a cervical contour bed pillow to keep you sleeping on your sides and prevent apnea episodes. If you suffer from sinus problem or nasal congestion, rinsing your nasal passages with saline solution with several drops of peppermint essential oil will work as a natural decongestant and analgesic. Rubbing a small dab of Vicks menthol rub near your nostril will also help clear your congestion throughout the night as well. Rid your room free of electronic devices such as TVs, cellphones, tablets, and computer. These devices can emit a blue light source that will diminish melatonin production throughout the night and make you feel sleepy throughout the day. If your spouse must keep these devices in the room, you should use an eye mask to block out the light. If there are too much disturbance from keeping you sleeping at your designated time, you may want to sleep in a different room. Drink less water before sleep. Create a sleep ritual to prepare your mind for sleep. A warm bath, massage, meditate, relaxing yoga before bedtime can help clear your mind from anxious thoughts and lower your cortisol level for sleep. Exercise daily during the daytime so that you can sleep better at night. The exercise will also help to alleviate stress and anxiety. Avoid using technology devices close to bedtime as the blue light will keep you awake even after you turn off all the night to sleep. Following the doctor’s instruction and use your sleeping aid every night so that you can sleep better at night without interruption. Do not stop using the device when the symptoms go away as the symptoms will quickly return. Check your blood glucose level before sleep and adjust for hyperglycemia or hypoglycemia conditions to avoid nightmares and waking up from your diabetic conditions. Although obesity may not be part of the diabetes-sleep equation, it often becomes a key component in diabetes and sloop disorders. By eating wrong choices of foods, you are more likely to cause a hormone imbalance that will affect your energy level, your blood glucose level, and your quality of sleep during nighttime. There are certain food that can benefit your sleep whereas others that may disrupt your sleep. By picking the right food to eat, you are on the first step for a good night’s sleep. Reach for foods that are rich in tryptophan. Food that are high in tryptophan are turkey, nuts and seeds, bananas, honey, eggs, and milk. Carbohydrate-rich foods and dairy foods duo increases the sleep-inducing tryptophan in your bloodstream. So if you must eat a late night snack, a bowl of cereal and milk, yogurt and crackers, or bread and cheese are the best choices. If you struggle with insomnia, a small snack will help keep your blood glucose level stable and allow you to sleep better. Comfort food may not always be good for you. Foods that are high in fat content will be more likely to disrupt your sleep cycle as it triggers more trips to the bathroom. You should be aware of hidden caffeine in your food, as it will disrupt your sleep cycle. Some hidden caffeine food can be hot chocolate, any chocolate dessert. For better sleep, cut all caffeine from your diet 4 to 6 hours before bedtime. The old myth of drinking alcohol helping with insomnia and sleep. Although it may help you fall asleep sooner, you may experience frequent less relaxing sleep. At the same time, you may experience night sweat, headaches, and intense nightmares. If you drink alcohol in the evening, take each drink with a glass of water to dilute the alcohol’s effect. Like caffeine, you should avoid alcohol 4 to 6 hours before bedtime. Stay away from heavy, spicy food for dinner. These foods have the highest tendency to cause heartburns and acid reflux reactions. Keep protein to a minimum at bedtime, as they are harder to digest. Smoking is bad for your health. Because nicotine is a stimulant, it will keep you up at night when you want to get some rest. Incorporate more vegetables and lean protein such as fish into your diet. Limit your caffeine intake in the late afternoon and evening so that you will not be stimulated during sleep. Here are some great products that we recommend. A noise reducer can came in many different shapes and sizes, but it’s function remains the same: to reduce outside noise by creating ambient or white noise. Many people van be very sensitive to a particular noise such as airplanes, trains or even the slight hum of your refrigerator in the other room. A noise reducer helps to block our or reduce that noise in order to prevent it from disturbing your chance at a good night’s rest. Sleeping is designed to be done in the dark and as such our bodies are programmed to respond a certain way once lights are all out. But sometimes we might find ourselves with just a sliver of light peeking at us from outside our windows or maybe even from our charging phones. A sleeping mask solves the problem of reducing the exposure to light that we may have and makes it possible to sleep during the day or night. Aromas can play a powerful role in the way we feel. Finding scents from plant oils or essentials oils that induce a state of relaxation can help you ease into a better night’s rest. Some very common scents for rest and relaxation include Lavender, Vanilla, Valerian, and Jasmine. Generally background noise is considered a no-no when it comes to rest, but relaxation music is the except. Music can help the mind come to rest and also begin to simulate a stage of ‘pre-dreaming’ that can help us fall asleep easier. Choosing ambient music or classical music can be helpful is giving you a good night’s rest. There are many different type of air purifiers, but as long as they are not too loud and does not keep you from sleeping due to the noise, many people find it helpful. It’s especially useful during allergy seasons. You should look at the long term costs of air purifiers, not just the initial purchase price. HEPA filters while popular are very expensive in the long term, so if you are looking for a HEPA, consider how much it will cost years down the line. Blackout curtains are curtains that have a liner behind them to block light. They are available in all kinds of colors, patterns and sizes. They help by blocking out any form of light that tries to peek through your windows. Similar to a sleeping mask, they help to keep your sleeping area dark which can help you get a good night’s rest. Here are some tips on how to find the right bed, pillow and beyond. Getting the right mattress translates to more than just finding something that feels good when you lie on it. It means getting the right material, the right firmness, and even the right composition. There are a variety of mattresses available, ranging from latex to memory or gel foam and even spring mattresses. Firmness can range from plush top to very firm. Since everybody’s body is different, it’s not surprising that we all prefer different beds. Doing the proper research into the right mattress can help ensure a better night’s rest and a better fit for your body. The same rules for your mattress also applies to your pillow. Pillows are available at different heights, different materials and even different shapes. There are also pillows available for different parts of your body such as your knees, or even a body pillow. Pillows help with your overall alignment and comfortable in bed, so choosing the right one is an important part of your sleep. Adjustable beds sounds like a marketing gimmick, but for some people it’s actually the real deal. Adjusting your bed can help with reducing pain, especially for people with hip and knee pain and ultimately lead to a better quality sleep. Herbal Pillows are scented pillows with specific herbs that help you relax when you rest upon it. It combines the idea of aromatherapy and a comfortable pillow to bring you the best of both worlds so that when your head hits the pillow you’ll instantly be transferred to a world of rest. It might seem like a small thing, but the soap you use to wash your bed sheets could be interfering with your quality of sleep. People with allergies can be sensitive to soaps and softeners which can lead to restless and uncomfortable sleep. Try to omit the use of softeners when you wash your sheets and when it comes to soap, opt for something that is ‘Free and Clear’ or free of scents and dyes. List of some greap apps that can help you. Night Shift is a small device that is worn on the back of the neck. It will vibrate when the user begin to sleep on their back and slowly increases in intensity until the user switches into another position. At the same time, it can be sync to your smart devices so that you can keep track on your sleeping habits. This is beneficial for patients who have mild sleeping problem and are prone to snore when they sleep on their back. They are not beneficial for individuals who have acute neck, shoulder, or back pain. At the same time, it is also not suitable for those individuals who with cardiac arrhythmia corrected with an artificial pacemaker, or who have skin sensitivity or an open wound around the neck. 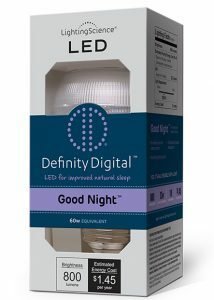 Developed specially for NASA astronauts for melatonin regulation, this artificial LED light bulb is the only biologically corrected white light LED light bulb on the market that does not have any blue light frequency from the light source. By using this light bulb, you no longer have to worry about your melatonin level being affected by your room lights. This App can be used to diagnose your sleeping pattern and sleep disorder. By tracking your sleep cycles throughout the night, you can show the data to your specialist for an easy diagnosis of your symptoms. This App also includes a white noise function. By listening to various sounds (for example, rainfall, white noise, ocean wave sounds), you can easily tune out the noises outside of your room and let the repetitive sound lull you to sleep. If you or your spouse must use your devices before bed time and keep them in the room, this app will be your life saver. By running this app, your screen color will be readjusted to reduce blue light from emitting. This way, your eyes can take a rest and your melatonin level will not be affected. 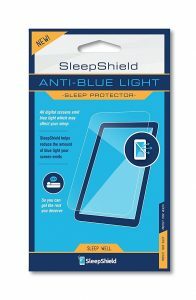 Working similar to the Bluelight Filter for Eye Care App, these sticky films can be applied to your tablets, smart devices, and laptop to filter out the blue light source. If sticking a film onto your devices is not your cup of tea, or you work in a profession that requires staring at a blue light source for long duration of time, you may want to look into these glasses. 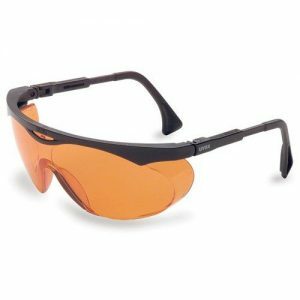 Just by wearing a pair of these orange lens glasses, your eyes will be protected from eye fatigue, cataracts, and age-related macular degeneration. At the same time, you can keep working without worrying about your melatonin level being affected from the blue light source. The effects of sleep disorders can be so disruptive that you will likely want immediate results. Unfortunately, long-term cases may take more time and effort to resolve. However, if you stick with your treatment plan and regularly communicate with your doctor, you can eventually find your way to better sleep. Please note that even when you see immediate results, you should stick with your treatment and listen to your doctor’s recommendation because the symptoms may return just as quickly once the treatment stops. 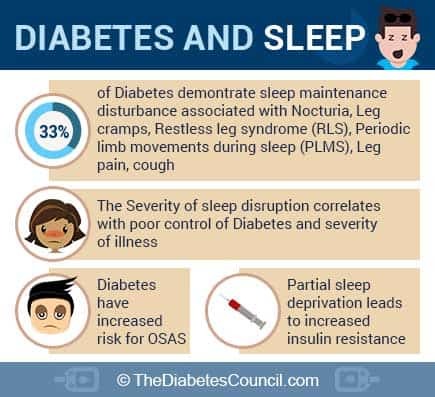 For those with diabetes and caregivers of those with diabetes, sleep conditions and lack of sleep unfortunately is a common occurrence. Learning to sleep more hours each night and to help your body get into the deeper phases of sleep can help you to feel better. We hope that this article has answered some of your questions and concern about sleep disorders and how you can treat your symptoms. If you have any questions, concerns, or comments, please leave us a message. We look forward to hearing from you. Sleep is an important part of your daily routine and it is important to know how that works. My name is Janene and I thank each and everyone of the Team who created this article. I am lost at the moment. I have read the occasional article one in reddit that describes what happens at night when my husband goes into a sudden and deep sleep, before he has completely undressed, his right side is hanging off the bed, his glasses on and twisted and his head is bowling ball heavy. If I gently and politely suggest he needs to finish getting ready for bed – things become difficult. He is not the same person. The reddit website suggested largely to dump the partner or tell her not to ever wake him. But is it okay to leave your treasured husband hanging off the edge of the bed, head dropped down heavily on his chest, snoring heavily with the lights on and he is not ready for bed. Am I the problem for being distressed at what I see? He also, in that state grabs me really hard which gives me the fright of my life. He cannot remember anything in the morning. We used to talk a bit at bedtime, get things finished from the day and ready ourselves for tomorrow. Since he became an insulin dependent Type 2 diabetic this has become an every day thing. The snoring I can handle. I sleep in the spare room, but the rest of it worries me to death. The reddit comments make me feel really bad and really sad. He looks like he has passed out. He is not in bed lights out and peaceful. Can you offer advice as I feel that his disbelief of what happens and therefore no consultation with a physician is really scary. What if something really bad happens to him because I can’t convince him to tell the doctor what is happening.